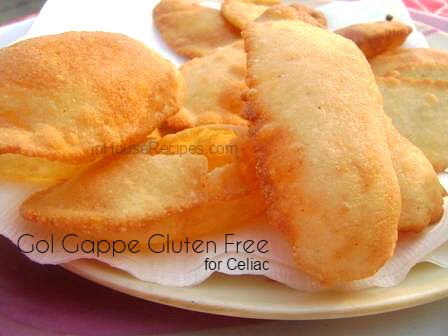 Gluten free Gol Gappe for people, allergic to Gluten and are suffering from Celiac disease. Make Crispy Pani Puri at home with tried and tested recipe. We can't really get enough of these. My all time favorite and a must have on Indian streets. You can't complete your shopping without the mouth watering Gol Gappas. They are called Pani Puri in Western India and Puchka in Kolkata region. Though Gol Gappas are normally made with All Purpose Flour (Maida), these are for those special persons who are allergic to Gluten. For those who do not know, there is a disease called Celiac which makes a person allergic to an element present in wheat, barley and some other products. There is no particular medicine to cure this disease. 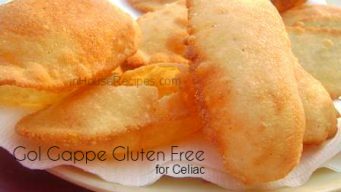 The only option available is to eat Gluten Free food items like this one. Take a bowl and add Rice flour and Soyabean flour. Add Salt. Mix well. Now add small amount of water gradually to make a tight dough. Do not add all water at one go. Use your hands to mix the dough well. If you feel that your dough is a bit light, you can add rice flour to make it tight. Cover the dough with a lid or a cloth for 10 min. and keep aside. After 10 min., grease your palm with oil and roll the dough on your hand as shown. Now take out small balls from dough and grease them too with oil. Use rolling pin to roll the small ball with smooth hand and give an oval shape. Roll all balls in the same way. Roll with smooth hands and light pressure else the dough will break itself. Take a frying pan, add Oil and heat on medium flame. Add Gol Gappas for frying. Push on top of Gol Gappas using spatula to help them fluff themselves as shown. Not all pieces may fluff well. You can use the non-fluffy ones as Papri!! Gol Gappa is done when it turns light golden brown. Take it out from pan. Enjoy Gluten Free Gol Gappas and help us improve by providing your reviews.